No doubt about it, the holidays are one of the most stressful time of year. And, as women so often do, we spend a lot of time making sure everything is "just so" for everyone else but ourselves and that invariably leaves us burnt out by the end of December. This year reclaim your holiday sanity with a little something special. 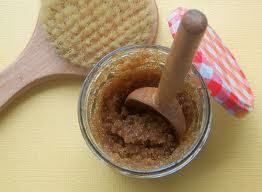 This yummy body scrub is easy to make (and I mean EA-SY!) and might just make you linger in the bath or shower for a few extra relaxing minutes! It makes a wonderful gift, too! Just package it in a small jar, wrap some raffia or ribbon around it and you're done! Mix all of the ingredients well. Massage scrub over your body and rinse with warm water.